How often does something that wasn’t planned occur in a day? Do you sometimes have new elements that must be squeezed into your schedule? I am sure you do… Unforeseen events and circumstances are a part of life. In a daycare setting, you may, for example, have to deal with a substitute early childhood educator, visitors, or sick children. It’s precisely because of this reality that a message board can be extremely useful. A predictable and consistent daily schedule is essential for children. It helps them understand the events that make up their day as well as their sequence. It also makes it possible for children to thrive within a comforting structure. Of course, having to adapt to small changes is perfectly normal. Learning to be flexible is also important for children. The ability to discuss with your group and warn children of changes at the start of each day is important. I suggest creating a simple message board to help illustrate any changes or special events that have been added to your regular daily schedule. Whether it’s a substitute early childhood educator, a child who is absent, or a special activity, information can be shared on your message board. 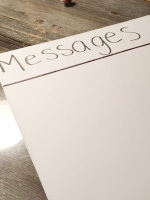 Discover how to make your own message board. To begin, cut the poster board to the desired size. Write “Messages” at the top. 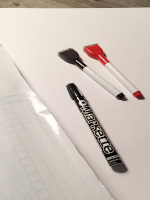 Laminate the poster board with clear adhesive paper. Hang it on a wall. Your message board is ready for use. Use it daily. The message board should be part of your morning routine. Once all the children in your group (or almost all of them) have arrived, take a few minutes to check your message board together. 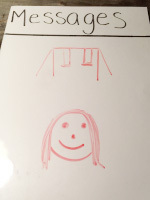 Use drawings to represent any changes to your regular schedule. For example, if children were to look at the message board shown below, they would quickly understand that they will be going to the playground. They will also expect a female visitor. Adapt the message board per your needs and personalize it so it represents your group.